Nadra Ehrman: Where You At? Yes, you read the headline correctly. By speaking this way, others may view me as uneducated or unintelligent. Nadra Ehrman is a residential community manager with The Towbes Group. Although, I can speak this way with my friends without a second thought, I understand that in a professional setting, appearance and ability to communicate in a standardized, conventional manner is paramount. However, it is easy to write someone off or to look past them as a contributing member of society if they don’t fit within a certain construct. In his recent U.S. tour, Pope Francis warned of the dangers of a “throwaway culture” that is quick to devalue people through our political, environmental and economic institutions. Everyone has value and deserves a place at the table when finding solutions for systemic issues in our society. This has been reiterated through two recent experiences. I am currently a Katherine Harvey Fellow, a program run by Leading From Within that invests in future community leaders so they will have the skills, connections and confidence to engage in issues important to them and to our community. Through this program, I also had the opportunity to attend a recent Environmental Grantmakers Association retreat in New York. I am learning that nonprofit organizations, trustees, volunteers, for-profit organizations and anyone wanting to create lasting positive solutions in their community, country and world must look past conventional wisdom in partnerships. We have to be willing to sit at the table with people who look different, talk different, live on a different side of town, have a different educational background or different cultural/political views. These are the folks who have an invaluable wealth of knowledge outside of our reach. But how do we do open ourselves up to the plurality of experiences and values? We have to look for what connects us as people, as a community and a world. We also have to be able to challenge our beliefs and cultural norms to gain perspectives that lie outside of our comfort level. With so many different ethnicities, races, religions, political and cultural world views, we have to break down our internal barriers to create real change. One of the greatest barriers is fear. “Fear is what separates us,” Ron Gallo, president and CEO of the Santa Barbara Foundation, told our group of Fellows in a recent meeting. For that meeting, I arrived prepared with several questions involving the topic of problem solving but when he laid this nugget of truth on the table, all my preparation was irrelevant. Instead of causal facts and figures this was a direct statement that spoke to the root of our humanity. And if fear separates people from forming lasting partnerships to catapult positive change, I believe trust is a main culprit behind that fear. How can we make lasting partnerships if trust is questioned? In that same meeting, KHF co-facilitator Jim Morouse offered the idea of using connectivity to build trust. Finding what connects us is so important. Listening to leaders in our community, bonding with other Fellows and my mentor, I am constantly inspired by the energy and drive to push the needle forward. We all come from many diverse backgrounds, but our passion to create positive solutions in our community connects us together. This idea of connectivity was driven home further when I had the opportunity through the Fellows to participate in the Environmental Grantmakers Association retreat. This annual retreat brings together funders, foundations, trustees and nonprofit organizations with an environmental focus. This year’s retreat theme was “We’re All Connected.” I had to laugh at the serendipity of it all. The theme of connectedness was introduced in my Katherine Harvey experience and presented again at the Environmental Grantmakers retreat. Through both experiences, I’ve learned that the true value of connectivity is not trying to make someone else think like you or change their mind, but to find a point of agreement and build from there. Sometimes finding that place of connection means we have to step outside of what’s familiar. At the Environmental Grantmakers Association retreat, actor Mark Ruffalo spoke about his work to ban fracking in New York. He said that to create real change, you have to get uncomfortable. The statement stuck with me. Growing pains are called that for a reason. Having “Where You At?” as the headline of this article makes me uncomfortable. It may make some readers uncomfortable, too. But, that was the point. We can only understand what we have the capacity to absorb at that given moment. Tension and sitting in uncomfortable spaces tell us how we are progressing, or not progressing in a project, process or partnership. We have to allow ourselves space to be honest with where we are in relationship to our cause and community. Simultaneously, we need to offer the same grace and acceptance to any partners we interact and build with. We have to be open and to fully engage people from different socio-economic, political, cultural, racial and religious backgrounds to find that priceless point of connection. We all play a part in our community, therefore we must all be a part of real, lasting progress. We have to allow our egos to be attacked and challenged mercilessly. Only in that process can we effectively deal with deep truths that are often overlooked for the sake of convention. And only with those truths can we create the most effective solutions for our community while removing barriers that no longer serve our purpose. Seeing the power in these lessons from the Katherine Harvey Fellows and Environment Grantmakers retreat, I am committed to utilizing them both in my professional and personal life. I will strive to look for places of connectivity with people who may seem on the surface to have no common values or interests as me. I will allow myself to “feel the burn” of uncomfortable situations when they arise in order to find the root of the unease. — Nadra Ehrman is a residential community manager with The Towbes Group and has been with the company for six years. She previously worked in San Diego for two nonprofit property management organizations, San Diego Youth and Community Services and St. Vincent de Paul, where she was involved in programs providing housing and supported services for at-risk youth. Nadra graduated from UC Santa Cruz with a bachelor’s degree in Fine Arts and a minor in History. 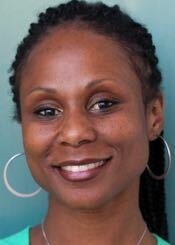 She is a member of the Green Business Program of Santa Barbara County Steering Committee, the Kellogg School Site Council, The Towbes Group Employee Advisory Board Committee and is a Katherine Harvey Fellow. The opinions expressed are her own.